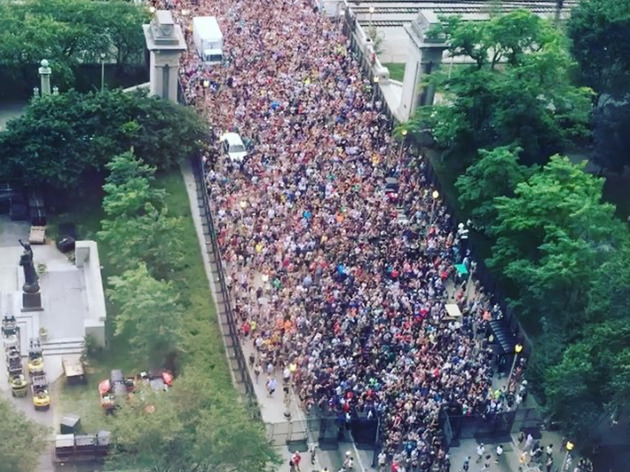 Lollapalooza was evacuated around 2:30pm today, just like Pitchfork was cleared out two weeks earlier. This time the evacuation was proactive, unlike in 2012 when organizers made a belated decision to clear out attendees just before a storm hit the grounds. 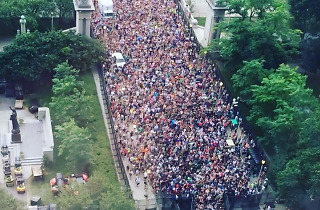 Seeing a gigantic purple Doppler blob headed directly for the festival, fest authorities made the call and Chicagoans poured out of Grant Park in one massive horde, inundating the bars, restaurants and hotels on Michigan Avenue and in the Loop. Winds lashed through downtown, but rain merely sprinkled down, barely wetting the streets (the White Sox game, taking place just south of the park, went on uninterrupted). The storm may have been anticlimactic, but Lollapalooza's concerns were justified—the suburb of Lincolnwood, just north of Chicago, did see some hail. The "small storm" quickly passed and in its wake was the same azure blue sky we've been enjoying all weekend. With an updated schedule available online, Lolla is officially back in business. Party on, Chicago. The #Lolla gates will officially reopen at 3:30. The music will resume at 4p. We'll be updating the schedule shortly. Stay tuned. And the gates are open again!